Concert as part of the Festival FAB. 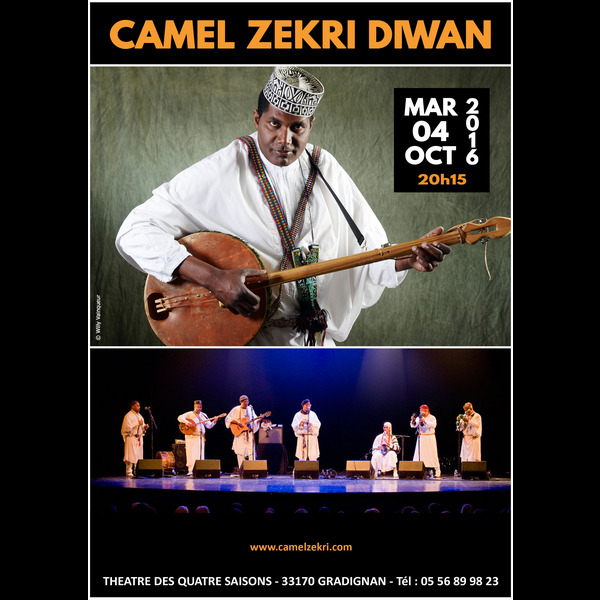 Expert guitarist and composer, Camel Zekri is one of the major figures of the renewal of the Gnawa tradition from southern Algeria to which he adds the Mezwed repertoire of present-day festive music like rock, jazz, funk. A link between ancestral memory and modernity, he galvanises his audience. The Gnawas - « those who come from the countries of Black people » - are descended from slaves of Sub-Saharan Africa, deported by the Arabs to the Maghreb and bearers of ancient oral traditions. 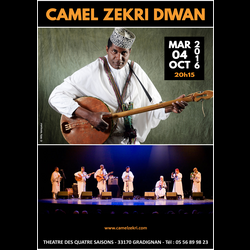 Therefore in order to celebrate those rituals of Gnawa trance - called Diwan in Algeria - are gathered on stage four traditional musicians from Biskra (« gate of the desert » in the south of Algiers), who mix the sound of guembri and krakebs with the trombone, saxophone, trumpet, electric bass and drums of five Western musicians. A synthesis filled with symbols that bridges the gap between heritage and contemporaneity, and this around the guitar of the maalem, "the master musician". Théâtre des Quatre Saisons, Parc Mandavit, 33170 Gradignan.